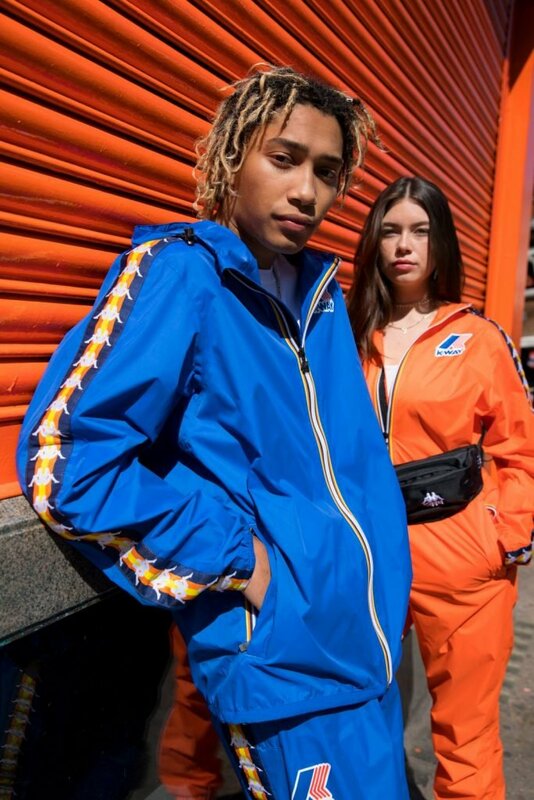 Iconic sportswear brand Kappa has joined forces with the ultimate pac-a-mac label, K-Way, to deliver a bold capsule collection. Celebrating their collaboration on Wednesday, the invite-only event was a hump day treat. Held at Motel Studios – an industrial-style space in Shoreditch – the settings were slick. Think brick walls, high ceilings, blue lights peppering the place. Essentially a low-lit, luxurious tunnel, the venue was vibing at maximum capacity and flagged with decks, pumping out the night’s theme tune. A number of guests turned heads in the relevant sporty chic getup, including Insta influencers and the boys from Rak-Su who were amongst the crowd. Drinks were free-flowing thanks to Peroni sponsoring the event and bubbly on tap. The new collection in question is a one-off six-piece boasting loud colours and 90s aesthetics. Ready for AW18 it includes hoodies, track pants and K-Way’s original waterproof jacket emblazoned with the iconic Kappa branding. As the sportswear revival continues to reign, Kappa x K-Way have just reset the bar.